For added flexibility, the CN51 is equipped with a voice-capable Flexible Network Radio, allowing the same device to operate on either a CDMA or UMTS wireless network in North America. With the ability to switch networks on-the-fly, enterprises with large, geographically dispersed workforces can rely on the CN51 to meet changing coverage needs and ensure anytime, anywhere access to business-critical information. The new CN51 is available with Intermec’s EA30 or EA31 imagers for optimal reading of 1D and 2D barcodes in various conditions, including low light scanning environments. With motion tolerance and snappy scanning, the CN51 also eliminates delays or user frustration during scan-intensive applications, ultimately improving worker productivity. The 5-megapixel color camera combined with Intermec’s cutting-edge image processing technologies also delivers advanced capabilities. Mobile Document Imaging (MDI) and Remote Deposit Capture (RDC) provide a fast and reliable way to convert full-size paper documents or check payments into electronic files while on the road, transmitting directly from the point of capture to the back-office workflow. Additionally, service solutions, like Intermec’s CloneNGo, offer device provisioning that makes it easy to replicate a master configuration across an unlimited number of devices to get up and running quickly. Intermec SmartSystems Management Console also monitors key sub-systems including scanning, communications, and device health, to prevent issues before they impact operations. Intermec’s Medallion Advanced and Support Services help protect your investment by reducing unexpected operational impacts of network communication issues or minimizing device downtime. 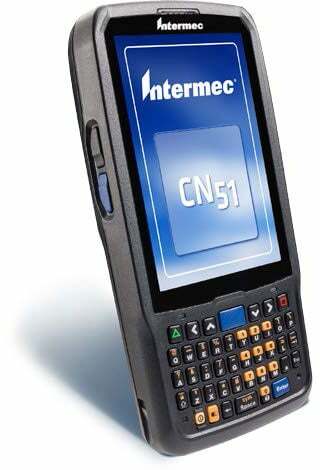 For more details or to order a new CN51, contact us at BarcodesInc.